Your conclusion is correct. The servo motor is asking a lot of current. You need a power supply that is more than 2amps. Connect the grounds (the servo black wire to the Arduino GND). Don't let the current for the servo motor go through the Arduino board. Use wires for the servo motor that can handle high currents. Don't let the power for the servo motor go via a breadboard, because the small metal contacts of a breadboard are not for high currents. Can you get a smaller servo motor? Could there be something wrong with the 2 A power supply? Is it a certified and good quality power supply? I found different sources, that state stall currents for this servo between 0.2A and 0.8A, so a 2A power source should be enough for one of these. From your wiring diagram (which looks good) I guess, that the Arduino is provided with power by other means (maybe USB). If not, please try it that way. You can easily use a USB power bank or a externally driven USB hub, if you don't want to risk your PCs USB ports with a currently unknown error. Your code is also ok (it's basically the sweep example code of the servo library). So there are only 2 possible culprits left. 1. The servo: It might be damaged. I have seen some forum entries, that there are many cheap versions of this servo, which don't meet most quality standards. Depending on where you bought it, it might also been DOA (Dead On Arrival: broken, when it reached you). 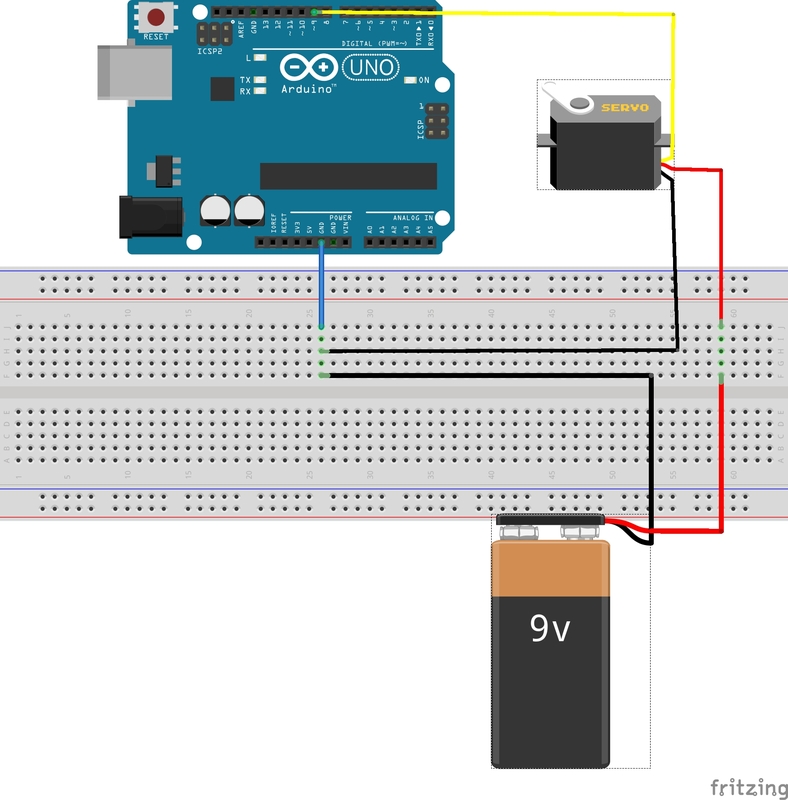 You should try to connect it with a capable power source (without any connection to an Arduino) and measure the current draw. If the current is too high (or the voltage again dips), disconnect it directly and throw it away. 2. The power source: You didn't write, what power source you used exactly. It might be the case, that it is broken, or that it does not provide the specified amount of current. Some power sources can break on a short (or on drawing too much current). You might have created a short while experimenting and broke it. Then you need a new power source. Test the servo first, with a fresh power source. The servo hasn't even rotated for 1 degree. This is fine, until you apply a control signal nothing much should happen. As soon as I connected motor to external supply, there was a huge voltage drop. The voltage became almost negligible. DC motor was working fine alone. This is a problem; it sounds like your servo is shorted, busted, kaput, no good. Not the answer you're looking for? Browse other questions tagged arduino-uno motor servo shields arduino-motor-shield or ask your own question.